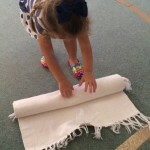 As part of the Prepared Environment, one of the first lessons a Montessori teacher gives her students is Rolling and Unrolling a Rug. 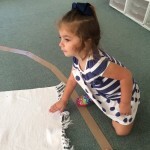 While it is a simple task, it is indicative of how control of the environment lends itself to further study (with works on the rug) and fosters student independence and care of the Montessori classroom. The teacher demonstrates the technique silently, using slow, precise movements. She begins by carefully taking a floor rug from the basket and carrying it with two hands. The rug is placed on the floor and carefully unrolled, smoothing with the hands as the rug is unrolled and gradually spread out on the floor. 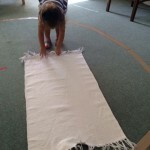 Once the rug is rolled out, the teacher walks carefully around the rug. This illustrates that the rug is a designated area for floor works, upon which the students do not step. Next, the teacher demonstrates the process of rolling the rug. Again, this is done in silence, with controlled movements. As the rug is being rolled slowly with two hands, the sides are checked from time to time to assure proper alignment. 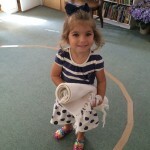 Then, the tightly rolled rug is carried with two hands and returned to its original location. 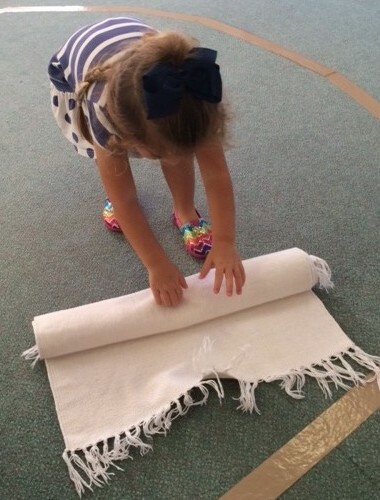 At this time, an explanation is given to the children concerning the use of the rug for activities carried out on the floor with a reminder that the rug is for the materials, not feet. Also, as with all lessons, once presented, the children are invited to perform the task as needed or desired. They now have the freedom to choose this activity within the framework of their Prepared Environment! 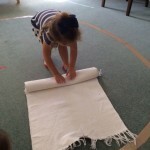 Here is one of our students who happily volunteered to demonstrate the technique of unrolling a rug. In the Absorbent Mind, Maria Montessori describes the first period of development–the period in which character is formed–as the most important period in human development. For the child at this time, “impressions do not merely enter his mind, they form it.”(The Absorbent Mind, Maria Montessori, Laurel 36). The child is endowed with creative energies that belong to an unconscious mind. These energies become conscious through work and life experience. If the creative work of the child is impeded, it will lessen his chance of achieving perfection and developing his character. “This is the new path on which education has been put, to help the mind in its process of development , to aid its energies and strengthen its many powers.” (The Absorbent Mind, Maria Montessori, Laurel 38). Although this seems like a huge responsibility for the Montessori teacher, her role is simply to provide the best conditions, a prepared environment, where the child may absorb on his own the works of life. “The child absorbs his environment, takes everything from it, and incarnates it in himself.” (The Absorbent Mind, Maria Montessori, Laurel 74). The responsibility of the teacher is then to provide this environment that is prepared so that the child may act freely on his own initiative, where he can choose works and develop his own social contacts. In this environment the didactic materials contain within them the control of error. In this space, the child educates herself, choosing her works, using the hand as “instrument of the brain.” (Maria Montessori, Her Life and work, E.M. Standing, Plume 111). Thus, the Montessori teacher, by creating a prepared environment, allows the child to “perfect himself through his own efforts.” (The Montessori Method, Maria Montessori, Schocken 172). For, as Dr. Montessori states, “a man is not what he is because of the teachers he has had, but because of what he has done.” (The Montessori Method, Maria Montessori, Schocken 172).